Do you want to make history? – YouTube. It is only a matter of time before elephant acts are banned forever. The Los Angeles City Council could soon approve a proposal that would make the use of elephants in such circuses as Barnum & Bailey and Ringling Bros. a thing of the past in the city, if the Council adopts the November 20 recommendation of its Personnel and Animal Welfare Committee. The proposed measure is contained in a letter dated November 1, 2012, to Mayor Antonio Villaraigosa, by L.A. Animal Services General Manager Brenda Barnette, providing seven options to regulate the use of elephants in circuses and other traveling circus shows within the City. The letter states that the Board of Animal Services Commissioners recommended by a unanimous vote of 3-0 that the Mayor and Council consider various options relative to the use of wild and exotic animals in traveling shows and exhibitions. Read full story here: L.A. City Council May Ban Elephants in Circuses and Use of Bullhooks. This is the third year that the UW-Madison has hosted the Forum on Animal Research Ethics (FARE). They have brought several speakers, including researchers currently using animals and other experts. Each presentation has been followed by a question/answer period, but little involved discussion. The main purpose of this forum was to discuss the ethics of nonhuman primate experiments at the UW Madison. Another purpose was to describe how monkeys are treated at the UW Madison. Has this happened? No it has not. The FARE Committee is holding an open discussion forum where they encourage all to participate. What topics should FARE bring to the public? What issues mean the most to you? Members of the committee will be there to answer any questions and take any suggestions you might have. Please attend this discussion and urge the members of the committee to hold discussions which will bring to light what actually goes on behind closed doors at the primate center and to discuss the ethics of primate experimentation. Check here for updates and information about FARE . Read more here: AFA e-Alert 11-28-12. Turkeys: Some people eat them. Some people feed them. LOS ANGELES (AP) — Turkeys: Main course or animal companion? OK, so it isn’t even close. According to the industry group National Turkey Federation, more than 46 million of the big birds will be served as Thanksgiving dinner this year. Just a few hundred will get to experience the holiday as a pet, said turkey rescue Farm Sanctuary. “I believe they make amazing companions, but they are different than cats or dogs,” said Susie Coston of Watkins Glen, N.Y. For one thing, turkeys get too hot and are too messy to come indoors, said Coston, the national shelter director for the Farm Sanctuary. Taking the large bird on as a companion requires more responsibilities than owning a dog or a cat, experts say. “If people are adopting domesticated turkeys, they should be aware that it’s not a simple endeavor and would take a considerable amount of work,” said NTF spokeswoman Kimmon Williams. “Turkeys as pets is a complicated question,” she added. Like other animals that serve as companions to humans, turkeys come in different breeds, with some weighing as much as 60 pounds, Williams said. Every turkey has its own personality — and some can be aggressive, she said. Most pet turkey owners agree the birds aren’t the kind of pets that can be walked on a leash or dressed for the Christmas family photo. “Turkeys are inherently nervous and do not tend to be warm and cuddly. Turkeys also need plenty of space to run around in and be fed the appropriate diet,” Williams noted. Still, Karen Oeh, who will be getting four pet turkeys just before Thanksgiving, said she preferred them over dogs. I understand that the Forum on Research Animal Ethics (FARE) committee is interested in suggestions for making the Forum’s events as effective as possible. I would like to make some suggestions. I am confident that these sessions will address concerns of those supporting Resolution 35, and I hope you will join me in supporting these planned informational sessions rather than pursuing Resolution 35. Obviously, Mr. DeLuca’s intention was to offer an alternative to Res. 35 that would answer certain questions, would satisfy the supporters of Res. 35, and would steer the supervisors away from supporting Res. 35. The most important element of Res. 35 was public, independent consideration of two questions: “How are monkeys treated during experiments at UW–Madison?” and “Are the experiments on monkeys at UW–Madison ethical?” Mr. DeLuca repeated the ethical question in his first letter. He did not cite the question of treatment. If FARE is going to meet Mr. DeLuca’s objectives, answer the questions that he cited, and provide an alternative to Res. 35 that will at least partially satisfy the supporters of Res. 35, FARE must inform the public about how monkeys are treated during experiments and it must engage the public in a meaningful discussion of the ethical question. During two years of FARE events, the public has heard very little about the treatment of monkeys during experiments, and the discussion of the ethics of the experiments done on monkeys at UW–Madison has been brief and superficial. Meanwhile, specific situations at UW–Madison that warrant transparency and public discussion — e.g., Ned Kalin’s maternal deprivation of monkeys and the flaws in UW–Madison’s caloric restriction protocol that were revealed by a similar study at the National Institute on Aging — have received no attention. Committee members need to develop a shared understanding of why the committee exists. The history of Res. 35 and Paul DeLuca’s letters provide the answer. A presentation about monkeys: their emotions, cognitive abilities, relationships, natural habitats, similarities with people, ability to feel physical and emotional pain, et cet. A balanced presentation of the housing of monkeys and the effects of laboratory housing on them. Letter to UW animal research committee | One Shared Planet. 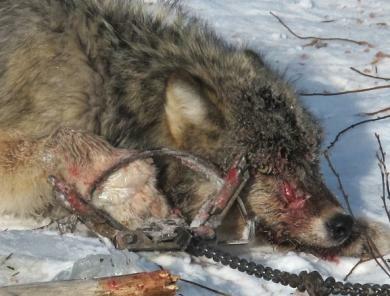 Hunters and trappers are not satisfied with the millions of acres already open to hunting and trapping in Wisconsin. They want it all. Read the article here: Patricia Randolph’s Madravenspeak: Come January, state parks no longer safe. Dear Editor: The case in which a Wausau woman allegedly poisoned and killed her boyfriend’s dog after the dog’s veterinarian failed to report a history of possible abuse is extremely disturbing. Veterinarians in Wisconsin (and every state) should be legally required to notify authorities immediately if they suspect an animal is being harmed, particularly since repeat offenses are common. Letting cruelty go unreported not only puts animals in grave danger, it also compromises the entire community’s safety. Animal abusers are cowards who take their issues out on “easy victims” — and their targets often include members of their own species. In my work, I have seen case after case in which people who abuse animals commit similar crimes against members of their own families and communities. Many batterers try to control their victims, such as a partner or spouse, by threatening, torturing, and/or killing the victim’s animals. The FBI has also found that a history of cruelty to animals regularly appears in its records of serial rapists and murderers. Protecting animals protects us all. Please, report suspected cruelty to animals immediately. PETA’s Martin Mersereau: Require vets to report cruelty to animals.